We the Living is available to clubs, schools, corporations, and other organizations for special event screenings. It's a great idea for a fundraiser. Licenses start at just $95. To start, choose the size of your group from the Options menu below, then click "Buy Now" to continue. 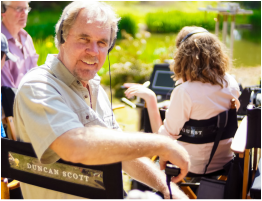 ​Q & A Option: To make your event very special, we offer an optional post screening Q & A with filmmaker Duncan Scott live via web-cam. Duncan partnered with Hank and Erika Holzer to produce the restored version of We the Living and he was one of the screenwriters of the Atlas Shrugged movie series. He has produced several videos about Objectivism, the philosophy created by Ayn Rand. The cost for each Q & A event is $100 regardless of group size. Please first email us at dscott@duncanscott.com about additional details and scheduling availability. The Q & A option requires high speed internet, Skype or similar web cam software, and a connection from your computer to your TV or projection system.